I don’t understand anything anymore. It’s a brick, in case you can’t tell that from the picture. 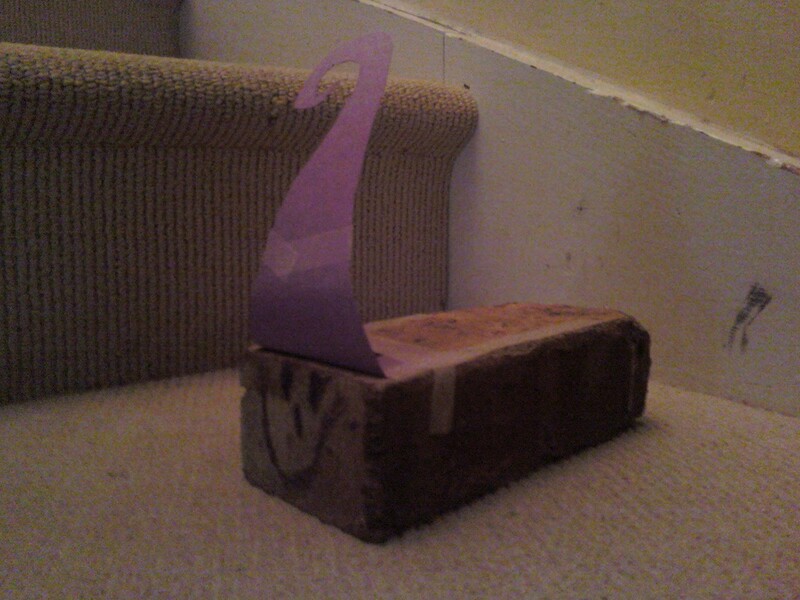 A brick with a purple construction paper curlicue, ostensibly representing hair, and a really goddamn big smile. #5 made it. I do not know where the brick came from, or what possessed #5 to name it Brickie and give it the sentience equal to his most favored stuffed animals. All of #5’s stuffed animals at this time were named what they were, with an “ie” on the end (believe it or not, this is an east coast man thing). Some nights he slept with Brickie. Several times Brickie joined us for breakfast. Brickie took part in many games and outings and blended right in with all the stuffed animals as if he were one of them. But eventually, as always happens with talismans of childhood, Brickie was set on a shelf and not taken down again. Which is understandable, being that he’s heavy. And a brick. (Also at some point his name changed from Brickie to Bob the Brick. I have no proof, but that stinks of #4, because she names all of her stuffed animals Bob.) Brickie, a.k.a. Bob, was practically forgotten. #5 packed Brickie, a.k.a. Bob, carefully away in his pillowcase, then in a box. He pulled him out of the box first thing at the new house and slept with him every night. That bears clarifying: #5 was sleeping with a brick for his pillow. It took some top-notch maneuvers from a favorite babysitter, but Brickie, a.k.a. Bob, was eventually freed. Liberated, if you will. He joined some other bricks in a pile at the edge of an outside wall at our new house. I would see him out there sometimes when I was taking the puppies out, or pretending to garden. He spent an enjoyable twenty-one months in the fresh air, surrounded by his own kind. Until this week, when suddenly and without explanation, he was buried. I don’t pretend to understand anything anymore. I just take pictures. Posted on April 8, 2011 May 1, 2011 by JM RandolphPosted in #5, Ha, The HeathensTagged bricks, family, humor, kids, parenting, step parenting, stuffed animals. haha.. I don’t know why, but I really enjoyed reading this post. Especially the end. Sometimes you just need to kick back and enjoy the ridiculous show called life! Wow, step to 5? I thought I was the only one wearing that crown, lol. Cute post! What a funny little #5. Great post, good chuckle. Congrats on Freshly Pressed. Imagine meeting you here! I wouldn’t have found this blog if it wasn’t for Freshly Pressed, so I am very happy. I can come back for tips! I have an entire file on my computer labeled “stuff my kids leave behind.” I peruse it when I’m in the mood for a good laugh — and your post gave me a good laugh this morning, so thank you! My marriage ended with a brick. A literal brick. So your post also made me shudder a bit! Oh well, at least there wasn’t a happy face drawn on it — and it wasn’t named Bob. I guess there’s that. Anyhow, funny post — thank you! This just gave me a brain storm…Imagine this-A Nutella jar mysteriously shows up at my door step! Holy crap. I must quickly act on this idea for the next FP. Mikalee, I also thought of you when I first read this post. Is that creepy??! It’s only because I love your blog, and who could forget that stupid brick!! I hope Brickie didn’t cause you too many bad memories. He was pure of heart. This is hilarious. I love it. I also love the purple had with the swirl on top. That is too funny. My son once had a twig named Barney. I think he may still be around here…somewhere. I think Brickie and Barney could have been great friends, if not for that pesky burying. Aaah, what could have been, RIP Brickie. Hahahahah Brickie ate breakfast too 🙂 now that’s classic!! That’s beautiful. I think I’m gonna dig him up so I can say these words over him. For what is a brick wall but a mausoleum for bricks? Fun post. Talented step-child. I see hairdresser in his future – who else could develop such a bold new purple-curlicue coif? Hairdresser. . .or mortician? Hmmm. Where would we be without the imagination of children? Cute story. Look forward to reading more! funny story…..sounds like a construction workers version of flat Stanley! Oh my goodness… makes me look forward to when mine are older. How incredibly strange and wonderful! Great post. Poor Brickie. He did live a good little life though. There are so many things we just will never understand. Like why my son slept with a one pound bag of coffee for the better part of his second year. Maybe it was the shiny packaging? The aroma? We’ll never know. Get out! He slept with a 1 pound bag of coffee? I love that! Is that symbolism because he knows how much coffee means to his mom? (I assume you drink it in the am like I do with all that laundry piling up). Speaking of… I gotta go do some. Stuff like this just makes you smile. Great post. Funny little guy he is #5. I really enjoyed reading this post. There are so many things that we just never understand. Maybe it’s the best we just never understand them and let it be the way it just is. P.S. great post – I will chuckle all day over this one. Congrats on getting freshly pressed! I must be good luck. Yep, that’s it. I’m like a lucky horeshoe or a rabbit’s foot. You are so lucky to have me as a subscriber. You’re welcome. I am very lucky to have you as a subscriber. I give you all the credit for there being no spooky crows perched on Brickie’s headstone. I like that the first “s” is missing from your “lucky horseshoe” above, because that makes it almost like something else, and that makes me happy. I’ll have to read more of your blog, this post most def deserved to be on FP! Congrats on Freshly Pressed! I am glad you are there to take the pics! Love it and your sense of humor! Love your site. And hello….what a cool header picture!! Your totally rocking it with the car seats! Brickie’s headstone had a wreath on it yesterday. I’m concerned we haven’t heard the last of him. I’m impressed that you do anything before coffee, with a 5 and a 3 year old! Have a look at my blog please, http://maimostafa91.wordpress.com/ ..still in the making! This was fantastic!!! Thanks for sharing it and brightening my day. Kids are very interesting, don’t ya’ think? Who knows what goes on in their brains? This is one of the cutest stories, though, thanks for sharing, and if that brick wasn’t adorable, I don’t know what is? Are you serious? You’re a bonehead. Yes I am. Thanks for the reply!!! You think blogging is more important than children? Hmmm. Brickie should come visit you. Preferably the back of your head! I left a bag of cat food open for the kids in the kitchen while I was writing this. I don’t see what the problem is. I accidentally bought it for the dogs, but they won’t eat it. I am a stepmom to three. No bricks here, but #1 used to have a piece of wood with a face on it. A brick and a piece of wood- it’s almost a bookcase! Great post, made me laugh. Just goes to show, the lavish money we spend on kids toys is pointless! Just make up things and give it to them on a regular basis and then recycle every few weeks. This is a great post! I love kids! FYI, its not just an East Coast man thing; my Southern California daughter also never named her stuffed animals anything other than what they were, with an “ie”. And she has a menagerie of them. Aside from the obvious Doggie and Kittie, there was (and still is) Wolfie, Snakie, Moosie, Snailie, and Tigee, just to name a few. Strangely, she did give each of the succluents and cacti in her cactus garden individual, although not descriptive, names. Pynkie (pronunced PIEnkie) and Corey are two that I can remember. Kids are so amazing. I’ll take a brick over a real pet anyday. Atleast the kid can decide when they die. This gave me a huge smile! It is so wonderful to see kids expressing themselves in different ways! Brickie rocks! Sorry he had to go! This was absolutely hysterical–doubled-over, rolling-on-the-floor funny! And congrats on freshly pressed, by the way. I recommend you hang on for the ride, lest you need to resurrect Brickie, aka Bob, from his rocky resting place to help with comment response. He would be more useful if he had thumbs. I wonder if we can do something about that. Well, you’ve let me in on some parenting secrets. Hopefully, I’ll be able to approach such ‘uniqueness’ with equal aplomb. Wow, where do kids get these ideas from anyway? Such funny story. It reminds me of some of the thing my sister and I would do when we were young, but I don’t think either of us would have slept with a brick. I enjoyed this because my manager’s name is Mr. Bricks and everyday I feel like I am dealing with a #5 , when in fact he is a live human being! Well done on your post and congrats on being freshly bricked, I mean freshly pressed! I love that there’s a Mr. Bricks! Great post. Very funny… Children are amazing, the way they assign life to anything. Makes the object seem different. I love it. Congrats on being freshly pressed. Amazing! It makes me so ready to see what kind of wacky things my 2 yo nephew will start doing soon. But looking back, I never remember having inanimate objects as pals but I vividly remember burying many a gerbil and guinea pig. It’s about time someone has stepped up to step parenting and had some fun with it. That’s probably the only way to survive. Wonderfully and joyfully written. Keep it up. Hahahaha! I don’t understand it either but it’s nice that you let the children go on and do their thing. Kids are hilarious. Congrats on the FP! My friend has always vowed that she would never have kids and never get married. Well, she just got married on April Fool’s day (yes, this lead to a ton of non believers) and now she’s an accidental step-mom to two. Also, I agree that spending tons of money on presents are obviously unnecessary. My favorite toy was a doll that my aunt made me, when she was totally broke. The only fabric she had around was blue. That’s why I named it Blue Baby and didn’t understand why that was an odd choice until I became a teenager. Congrats on being FP. Totally deserving, because this was adorable!!! I think I really like #5. My #4 sounds a lot like him, whose two front teeth just fell out. When I asked him when he was going to get started on his note to the Tooth Fairy, he sighed and said “you know Mom, I just don’t wanna deal with the Tooth Fairy right now.” !! Love parenting so much, with all the unexpected bricks and things. These little #5’s and #3’s shape us into better people, I think. It’s a lot, dealing with the Tooth Fairy. I totally get it. Hahaha. I love how for you to keep track you put a # on the kids. I totally understand, being the 6th out of 11 girls. lol. When I was younger my older sister and I would often go hunting for baby birds. By the time we would find them they were half dead. Falling from a nest can do that to you. We have about eight little graves circled around each other in our old backyard. I say ‘old’ because we moved. lol, the people that moved into our home didn’t realize they were really moving into a graveyard. Wow. I don’t even know what to say to that, except wow. I would totally dig moving into a baby bird graveyard. Must have something to do with the death of the housing construction industry right now. Because the child has advanced economic acumen he will probably transfer his allowance into green technology which means he may cut a hole in the roof for sunlight. Be ready. I can’t possibly be ready for that. But thanks to your warning, I’ll at least not be surprised. I have a similar story, except my #5 is my dog, and the Brickie in question was a pigeon wing. I can totally see this. wow, this was one of the funniest, most brilliant posts I’ve read for a while, and it’s not because of the writer but because of the kids, don’t you just love them? I personally prefer the term “2nd mom” vs. “Step-mom”…lol, but nevertheless, there are times when you don’t quite understand what’s going on in the minds of the kids. This was a great story…thanks for sharing. I loved this post. The writing. And Brickie. Sometimes kids are smarter–and more devious–than we think they are. They’ll take a break and make it a pet just to confound us. Pretty sure that’s what’s going on with this pet brick thing. It’s not us. It’s them. This is hilarious! Burying a brick and giving it a headstone. I love it. I love how much inspiration and ammo kids can give us! Quite entertaining! I look forward to all the imaginative things my daughter will do in the days to come. Congrats on the Freshly Pressed! I love all the things I’ve read about the kids. This made me smile and burst into laughter. LOL! Adorable. Sometimes we need a little silliness or even a random inantimate object to be our friend. brick? Toy ??!!)) is cruel), well, who knows, maybe the most beautiful thing). I’m glad he died in time before #5 figured out he could be a weapon. Not even Bobbie Brick? Oh well. Somebody link to Jethro Tull’s Thick As A Brick because I’m too tired to go find it. No need- merely mention the title, and it’s stuck in my head. Until I get to the part where I don’t know the lyrics and supplant it with Songs From the Wood, which I know better. i wish brickie had made it into the youtube world with a series of videos, for sure it could be much more pleasant and funnier that annoying orange..
..what car are you driving anyway? It’s a 1966 Mustang convertible. Miss Lucy. CC says I wouldn’t sell that car to buy him a kidney, but I might, if all the kids were found to be unsuitable donors. I still remember my ie adding to soft toy names face. Reddie, Blackie and Brownie were the names of three teddie’s of mine. But I never had a brick for a toy … but I did make paper dolls though. Your little one sounds like a creative type. This posted so funny. I just laughed it…Hilarious!!! Loved the post! My kids had interesting habits and playthings too! Wind up those imaginations and there’s no telling where they’ll go. Congratulations on making FP & looking forward to more cool stuff. I feel like I should send flowers for Brickies untimely passing….and to you for FP!!! He’s buried where our flower beds are supposed to happen- that will save you a step. This is just way to cute, and I am glad I stopped to read it, put a big smile on my face on this dreary rainy morning when I am supposed to go work a big out door event today, and according to the grrrrr weather bug & the looks of the cloud coverage it is going to be raining all day, I can now at least think of this adorable story and stop and lol. I used to live in AZ and still have sound guy friends there. One posted pics of his outside event this morning: wet, wet, wet. And it’s not even monsoon season, sheesh. Oh my gosh! I love this post. 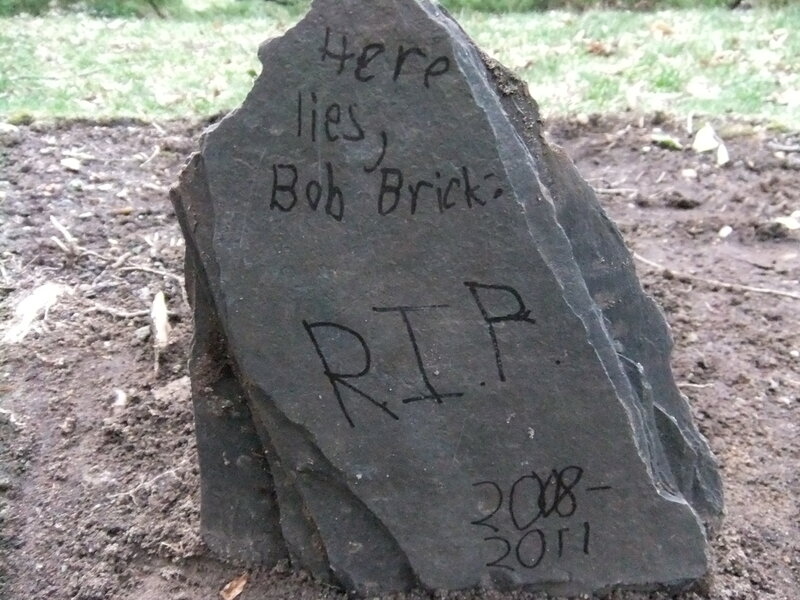 What a funny story – I laughed out loud, and found myself hoping that Brickie, aka Bob the brick, wasn’t buried alive. RIP, Bob. I loved reading this post! You had me laughing and remembering so many “toys” that my own played with growing up. Funny how it never really was the store bought version, but rather a box or rock from the yard! A very funny post. Had me laughing from the beginning. That is so awesome. Poor Brickie! Too funny. You just never know about kids. I think this story is not funny at all! Hey! Brickie died! And you think this is funny?! How did he die? Was it an accident? Murder? or what? We all have to die one day! And nowadays it happens that people disappear and nobody cares! Maybe your neighbor is dead and you’ll find it out only when it starts smelling! In my opinion this story is very deep! Many people have a heart made of stone and they think that it is funny. But it doesn’t matter who is buried – it’s never funny actually! Thank you #5! Whatever your real name is! Johnny #5? We need more heroes like you! Too funny. Yes, sometimes I just walk into my kids room and take pics of funny or unusual things she’s drawn or written on her erase board. I don’t ask either ….it just amuses me. That’s so funny! Just one of the many things I’ll have to look forward to. This post so perfectly captured the weirdness of children. Love it. This was great! The trials and triumphs… and of course, the questions…. of parenthood. I see just what you mean, sometimes attempting to understand is futile, but I applaud your decision to capture the moments nonetheless. Really nicely written. Kids’ imaginations can really be something else. I wonder what happened to Brickie. We’ve been getting a lot of rain. I’m seeing evidence of a shallow grave. I wish I’d been cool enough to read you before you got Freshly Pressed, but I wasn’t. So thank you Freshly Pressed, I’m a follower now! When will Brickie be released to stores? You guys are going to be crazy rich. He should be rising from the dead any minute now to take care of initiating the line. It was three days for Jesus, but I’m giving him a week, because he’s a brick. Excellent post – really enjoyed it! It will probably happen one day. At the hands of one of my kids. With six kids I still don’t understand! Some are smarter than I. Don’t know where that came from. They all keep us real. Congrats on being FP! Keep your sense of wonder about your kids. This is a wonderful piece of life described wittily, and with the insight that only a mom could provide. Number 5 will no doubt become great at what ever he attempts. This was AWESOME! Love the hair! Glad you take pics because otherwise you will forget these things. Too funny. Esp the brick dying. Great post. Thats so funny, but well written. I heart this post. My two-year-old sleeps with 4 alphabet flashcards: J for jelly beans, P for pretzel, B for balloons, and I for ice cream. She calls them her “presents” and cradles them like a newborn. A far cry from Brickie a.k.a. Bob, but still entertaining. Sometimes it’s good to just kick back and enjoy the ride. Wow, THAT’S awesome! Are those the only ones she’ll sleep with? Well done. Well written. I laughed at the interruption of logic – …he was buried. I’m thoroughly confused. I think I have to re-read now. I wish I had that simple loveliness in my life right now. Brickie lives on in all our hearts. Great read while enjoying a latte this Sunday morning! Thanks for sharing! I’m just a BIG KID at Heart! Absolutely brilliant story. Your writing style is hilarious. I laughed so hard. loved it. i lyk number five. Better buried then on a child’s bed and slamming is or her head accidentally onto Brickie’s and ending up needing stitches, or being buried with, him/it. I hope Brick have a happy after life. Thanks for the post. Reminds me of Sponge Bob Square Pants, maybe one day they will meet in Heaven. And better Brickie buried then on a child’s bed and slamming is or her head accidentally onto Brickie’s and ending up needing stitches, or being buried with, him/it. Thanks for sharing. Love how a title that could potentially express an uber-sad (and not unrealistic) sentiment about life fits absolutely perfectly for a super-sweet story. This is really funny! My mom always told us then when we were little she always had a camera around because we would come up with the craziest things. I also had a doll that I named Two because that’s how old I was when I got her and that’s all that I would say. Love your photos. RIP brickie. Well Brickie had a long life, it had great company and seems to have left behind great fond memories. RIP Brickie. This post was super cute. Children are odd little things. It’s fascinating to watch and wonder what goes on inside their heads. You obviously love them very much. I look forward to reading more of your posts. Thanks! P.S. Check out my blog, I just started it and would appreciate some input or advice. MILESTONE MAN is sorry for the sad loss of Brickie (aka Bob the brick) – RIP. At least you know that he was buried with a smile on his face! MILESTONE MAN would also like to commend you on your most excellent blog. Thank you, this made my night. RIP Brickie! Nice! Decoy duck, that’s a new one! I love your style of writing and the way that you describe amusing yet thought-provoking aspects of your wonderful life! Many thanks for making me smile! So I am new to the blogging world and yours is one of the first I have read. It is so completely funny to know that someone else’s children do things like sleep with bricks and it’s not just my world. Parenting is my biggest joy and one of the best comedies you will ever experience. Put some flowers on brickie’s grave for me, lol. Would you believe that I just came across new tombstones he put up for other bricks yesterday? Sheesh! Thanks for stopping by! “I don’t pretend to understand anything anymore. I just take pictures.” I laughed till my sides hurt. Thanks for sharing this. Hey. Did you read this?